SSL certificates are now completely free and NodeChef's managed cloud hosting service takes care of installing and renewing SSL certificates for your website irrespective of your development platform. From Apache based PHP web servers, WordPress websites to Node.js web servers we support them all on NodeChef using a container based architecture. On your end, you do not have to deal with low level stuff such as logging into Ubuntu or Windows Server and having to install Certbot to secure your website. Just enter your website domain, click save and your certificate is created and installed for you. That's it. In order to complete this guide, you must have your website running on the NodeChef cloud hosting platform. You must also configure at least the base domain for which you want to secure. For more information on adding a custom domain, you can reference the documentation page. 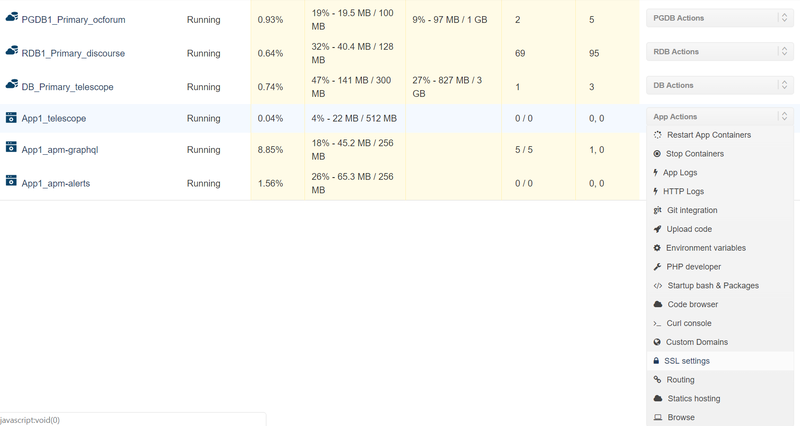 Log in to your NodeChef dashboard. On the Task Manager, click on App actions for your website and then click on SSL settings. On the SSL Settings section. Enter the list of domains you want to secure. You can enter multiple domains and sub domains. Separate each domain on a new line as seen below. For example, if your base domain is "example.com" and you want to secure "www.example.com", "blog.example.com" and "forum.example.com", you will enter them as seen below separating each on a new line. Click on the Save changes button. Once you click this button. 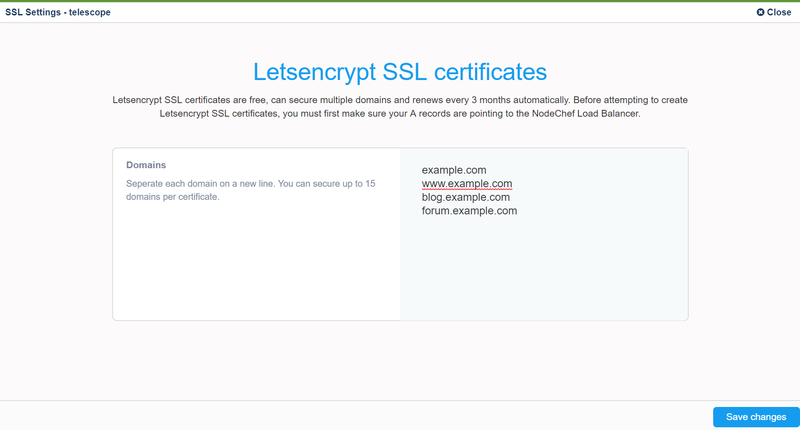 NodeChef will create and install the certificate for your website behind the scenes. The process can take up to a minute or so to complete depending on the number of domains you entered. At any point in time, you can add more domains and create the certificate again. NodeChef takes care of renewing the certificate automatically on your behalf once it is created. Your certificates typically expire every 3 months. NodeChef will renew 15 days before the certificate expires. We send you an email every 3 months when the certificate is renewed. If the renewal fails, NodeChef will send an email about this as well. In this guide, we saw how easy it is to secure your website with a free SSL certificate that renews automatically without any intervention from your end. This approach is more efficient and and straight forward than having to manage this process yourself on say AWS or DigitalOcean or rolling out your own solution which you still have to maintain. If you wish to know more about the Let's Encrypt certificate authority, you can check out their blog to stay up to date with all their initiatives.